This afternoon my wife and I visited the recently opened Denver Museum of Contemporary Art. All the exhibits are great, however, there is one exhibit that consumed the majority of our time (and of other museum goers as well). No, it was not some complex hard to figure abstract art. It was the simple “Legend (a portrait of Bob Marley), 2005” by Candice Breitz. Here is what Candice Breitz put together: In March 2005, 30 different people were filmed at the Gee Jam Studio in Port Antonio, Jamaica singing a capella (no instrumental accompaniment) of a compilation of Bob Marley songs. All 30 shots are then played simultaneously on a 30 channel installation viewed through 30 different flat-screen TVs (one person per TV screen). The coolest thing about this, is that even though it looks like one giant movie screen from afar, you get a spatial effect of the sound (the sound comes directly from location of the person on the screen) . That is simply because there are 30 different TVs with speakers right next to the each screen, so the audio comes directly from the location of the TV screen. I definitely sat there for more than 30 minutes (I could have watched all 62 minutes and 40 seconds of it) because, first I am a huge Marley fan and second it was fascinating watching these 30 individuals sing these legendary songs. They were not perfect singers, did not necessarily hold a tune and did not necessarily know the words to the songs. However, I was captured by expressions; their facial expressions and their body expressions both when they knew the words and when they were clueless. I loved the simplicity of the whole concept. This is a great exhibit to check out when you are in Denver, especially if you are a Marley fan. Be warned that this exhibit is pretty loud (which I think may annoy some people). 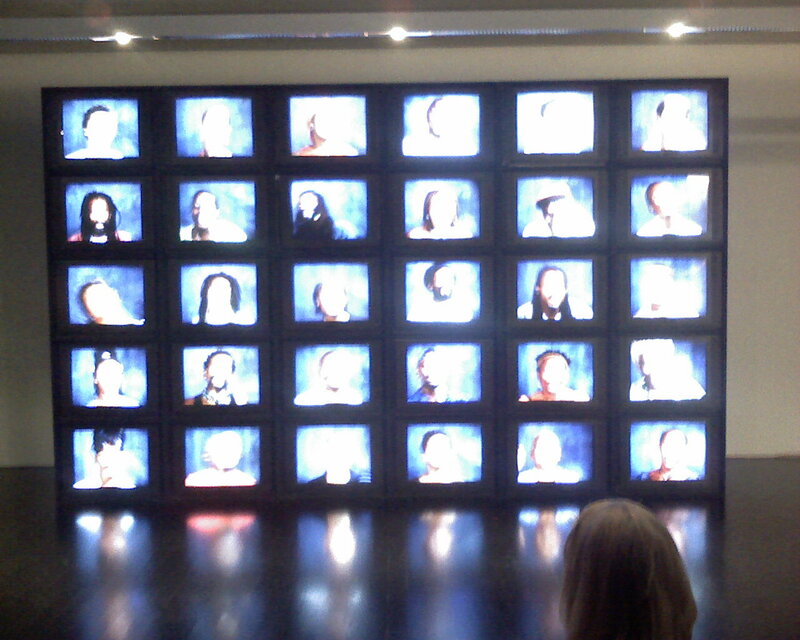 The voices of these 30 individuals echo through the whole museum. If you are a Marley fan, it’s a great sound track while you check out the cool exhibits that they have at the Denver Museum of Contemporary Art. Entry filed under: Uncategorized, Web 2.0.